Stirling councillor Karlo Perkov with Vicky Despa (Balga) and her daughter Georgia (10) with long neck tortoise by Lake Gwelup Primary School. TREES at Carine Regional Open Space are the focus of a school holiday activity. Children are encouraged to learn why trees are important and the essential role they play as part of the City of Stirling’s Tree Trail. The trail runs on weekdays over the school holidays. Stirling Mayor Mark Irwin said it was a great chance for children and their families to be immersed in nature rather than electronic devices. “There are more than 20 trees marked on the Tree Trail map for you to visit and each one has a sign that tells you all about the species living there. Those signs will also contain a letter for you to note down on your map and once you’ve collected them all, a secret message will be revealed for you to submit on the Tree Trail website to win a prize,” he said. 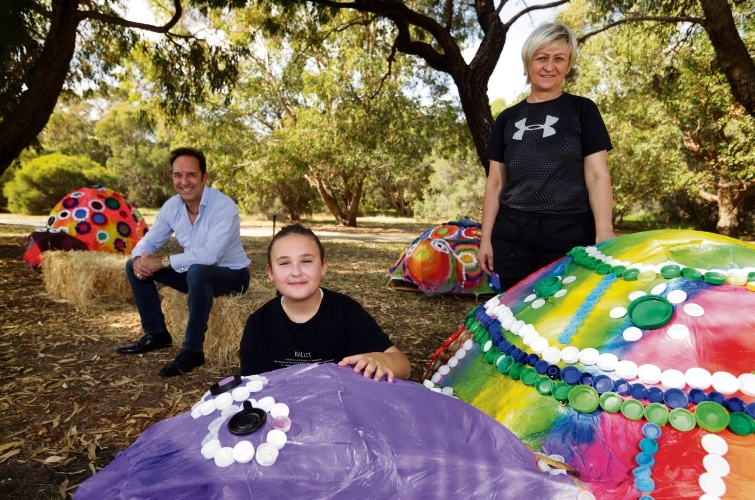 The Eco Faeries and Bindi Bindi Dreaming will visit the trail, with artwork by students at Churchlands, Gwelup, North Morley, Woodlands, St Denis, St Lawrence and Perth College primary schools featured en route.